Here’s a solution I’ve mocked up to speed up call handling times in a particular Call Centre scenario. Here we have Microsoft Dynamics CRM 2011 deployed into a Call Centre where our CSR’s are tasked with processing inbound calls. The CRM system has been integrated to the telephony system such that when the caller can be matched to a CRM Contact record that Contact record pops for the user. The telephony integration takes care of popping this form and provides us with the phone number of the caller. It also populates the subject field for us as well. 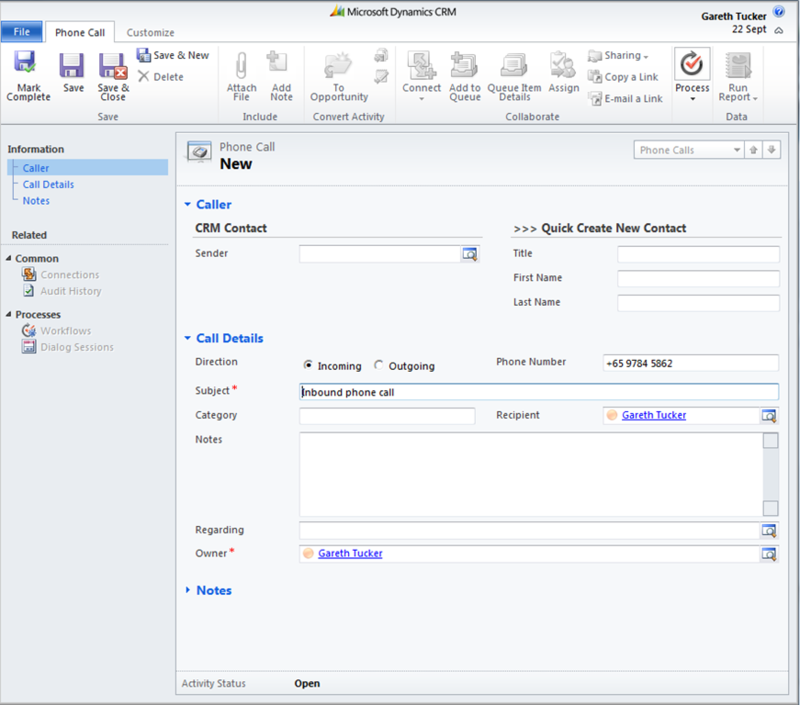 If the CSR’s conversation with the caller indicates they should be in CRM (suggesting that the number they have called in from is new/different) then the CSR can use the out-of-the-box Sender field to search for the caller. Note: As soon as the CSR populates one of the fields in this section all the fields in the section become mandatory. 3. The user tabs out of the Last Name field and custom code (jscript) is triggered. For the user, the back end processing is invisible. They simply followed an intuitive process. A little bit of jscript used in an supported (upgrade friendly) manner has allowed us to streamline the process by removing 6 clicks and one form load. In a Call Centre environment this is gold. Here’s the jscript behind this. 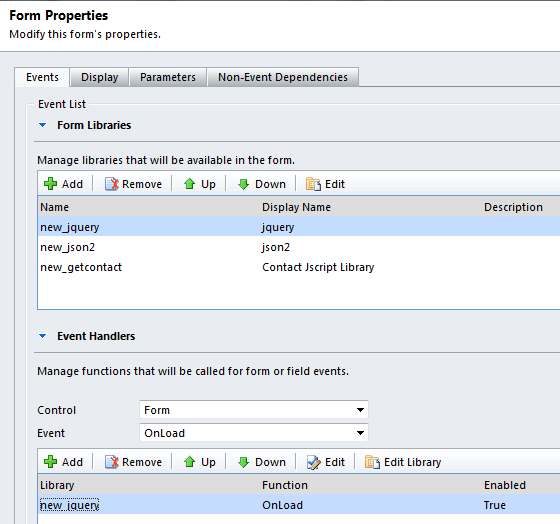 The OnLoad function needs to be attached to the form’s OnLoad event. The NewContact function needs to be attached to the OnChange event of the Title, First Name and Last Name fields. The CreateContact function does the heavy lifting. A CRM solution file containing these web resources and the changes to the Phone Call form are available for download here. This entry was posted in Uncategorized and tagged 2011, Call Centre, crm, REST on August 23, 2011 by Gareth Tucker. This post and the previous one are great. I have a business requirement where I have to copy record from Entity A to Entity B on Click of a Ribbon Button. On Entity A’s Form, i have created a Ribbon button called “Copy Record”, Because i was not able to trigger Plug-in from Ribbon button, i have used a hidden Boolean field (Yes/No) in the Entity A’s Form and on click on that Ribbon Button i am updating the Boolean field’s Value from NO to Yes. Then i am trying to trigger a plug-in which will create a record in the Update Message of Entity A. I Could not figure out where and why it is failing. I have a deadline so i was looking into other options, i visited your post and seems like it can help. Please direct me how to leverage your above mentioned code to copy record from one entity to another. Entity B’s fields are same as Entity A (Similar DataType, Similar Structure). Also i have 100+ record in Entity A’s form to copy over to Entity B. Will it possible to copy so many fields. Thanks very much for posting this. I have one question: how do you retrieve meaningful error information if the AJAX call fails? I’m displaying the contents of textStatus and errorThrown in the error function, but just get the text “error”.